Crisafulli uses its S-Series or J-Series direct drive, electrically powered, self-priming, centrifugal 1150 RPM and 1750 RPM pumps on the FLUMP, with a steel shaft extending from the motor to the pump. A hydraulically powered pump is offered as an option. The Rotomite seriess uses the Crisafulli 4" or 6" J-Series pumps. Beginning in 2013, Crisafulli has used GIW cast alloy pumps on the Rotomites-6000 CD, and CE to increase effiiciency dredging and pumping abrasive materials and slurries. 60 years of experience building pumps. Crisafulli has engineered and built pumps for more than 60 years and started business as Crisafulli Pump Company. Crisafulli pumps are proven reliable and effective. Crisafulli builds pumps in sizes ranging from 2 inch (the diameter of the discharge pipe on the pump) to 24 inches. Depending on size, horse power (HP), and application, Crisafulli pumps achieve flow rates of up to 18,000 gallons per minute (GPM). 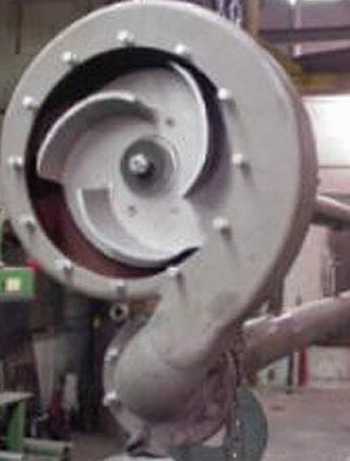 Crisafulli fabricates its pumps and engineers its pump impellers and volutes to handle abrasive slurries. Depending on pump size, Crisafulli pumps can process “base balls” - i.e., solids with diameters in excess of five inches. Process up to 150 cubic yards of sludge per hour. Depending on the size of the FLUMP and the desired sludge processing capability, the Crisafulli pump will have a 3 inch, 4 inch, or 6 inch discharge diameter. As a “rule of thumb”, the sludge processing capability of Crisafulli pumps used on the FLUMP will equal in cubic yards per hour the HP of the motor - i.e., a 100 HP motor driving a Crisafulli 6 inch pump will process 100 cubic yards of sludge per hour. Rugged construction. The Crisafulli S-Series and J-Series pumps used on the FLUMP and the J-Series pumps used on the Rotomite are American made in Glendive, Montana, manufactured with an ASTM AR400 mild carbon steel (BHN 400 hardness) pump volute and impeller, dual carbon/ceramic shaft seals. The pump is mounted directly behind the cutterhead and is lowered (with the cutterhead) into the pond on the FLUMP’s ladder (the pivoting arm on which the pump and cutterhead are mounted, extending from the dredge platform to reach the lagoon bottom during operation). Power. The pump has sufficient power to lift sludge up to 30 feet from the pond bottom to the pond surface and then to push the sludge horizontally up to 1,500 feet over water through the Crisafulli Integrated Floating Discharge Line, without a booster pump, to the designated dump site. Once the sludge or slurry is over land, the Crisafulli S and J Series pumps can push the sludge up to approximately 3,500 feet, depending on the topography and the consistency of the sludge. An important feature of SRS Crisafulli’s hydraulic dredges is their ability to pump dredged sludges and slurries over substantial distances to remote disposal sites. The actual distance in a particular application depends on several variables including: the nature of the slurry – i. e., the specific gravity, weight, and concentration of solids in the slurry, the model and power of the dredge, the size of the discharge pipe, the topography of the land over which the slurry is pumped – i. e., vertical elevation change from the dredge to the discharge site, whether or not a booster pump is installed in the discharge line, and, perhaps most importantly, the experience and skill of the dredge operator. If a site visit is required to properly specify a dredge for the customer’s application, travel and per diem charges may be necessary. SRS Crisafulli typically provides dredge customers worldwide with installation and training services by experienced Factory technicians as part of the standard specifications of a dredge sale. Proprietary pump designs. Over 46 years, Crisafulli has developed proprietary pump designs. “Crisafulli Impeller Inside” describes our pump line - vertical, PTO trailer, self-powered trailer, and submersible hydraulic and electric pumps. In most cases, a Crisafulli Pump is also used in Crisafulli FLUMP and Rotomite Dredges. With a Crisafulli Impeller Inside customers are assured of reliable high capacity dredging systems.